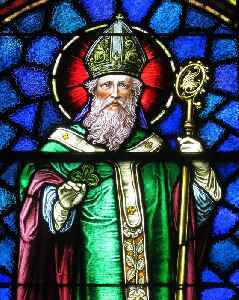 Saint Patrick (385–431) was a fifth-century Romano-British Christian missionary and bishop in Ireland. Known as the "Apostle of Ireland", he is the primary patron saint of Ireland, the other patron saints being Brigit of Kildare and Columba. He is venerated in the Catholic Church, the Anglican Communion, the Lutheran Churches, the Old Catholic Church, and in the Eastern Orthodox Church as equal-to-the-apostles and Enlightener of Ireland. Marc Lamparello's arrest was two days after he was arrested for reportedly refusing to leave a church in Newark.